Much of the documentation concerning RAF aircraft losses during WW2 no longer exists. When researching the details surrounding a specific event, it is largely a matter of chance as to whether any records survive - and down to the expertise of researchers to locate those surviving records! resulted in the discovery of the AM1180 crash records. 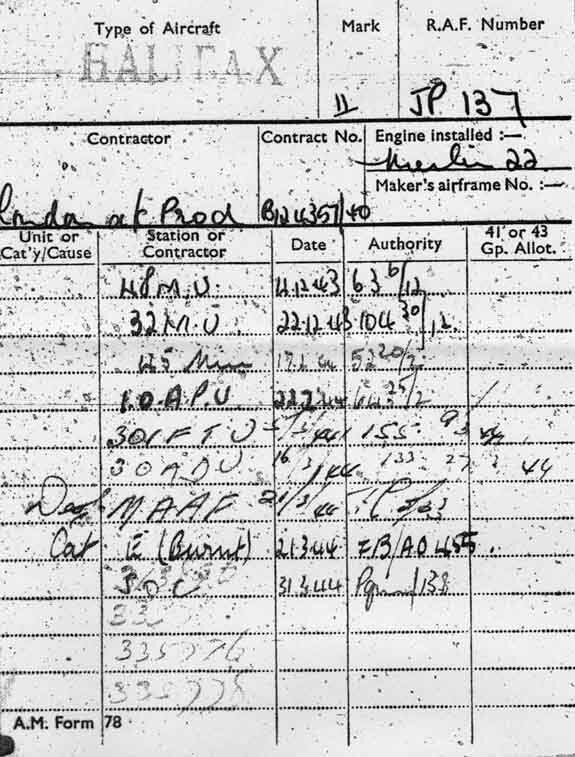 A copy of the aircraft AM78 maintenenance log was also uncovered. The papers relating to the 'Court of Inquiry' that was convened 2 days after the crash were not discovered, and for some time the 756(c) initial report seemed to have been lost as well. In the end, a copy of that latter item was discovered in Canadian records (Sgt. McGregor was a Canadian), so we were grateful to obtain a copy of that, from the Canadian archives. In fact, it appears that much of the detail from the missing documents has actually been entered, in summary form, onto the AM1180 form. 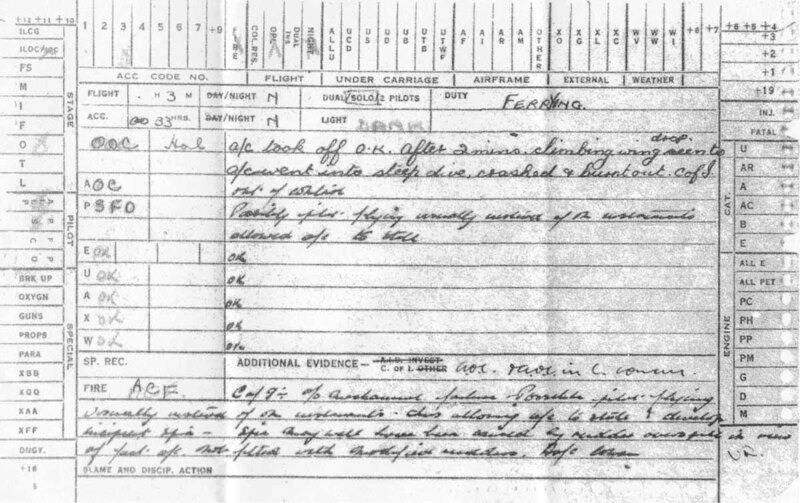 As a result, when added to the local press records from the time, together with a significant number of witness statements, and the additional records from RAF Hurn, we have been able to piece together a reasonably detailed idea, of the sequence of events that led up to the tragedy. Left click to see the images in greater detail - remember to use your back button to get back to this page - or right click to open the image in a new tab). 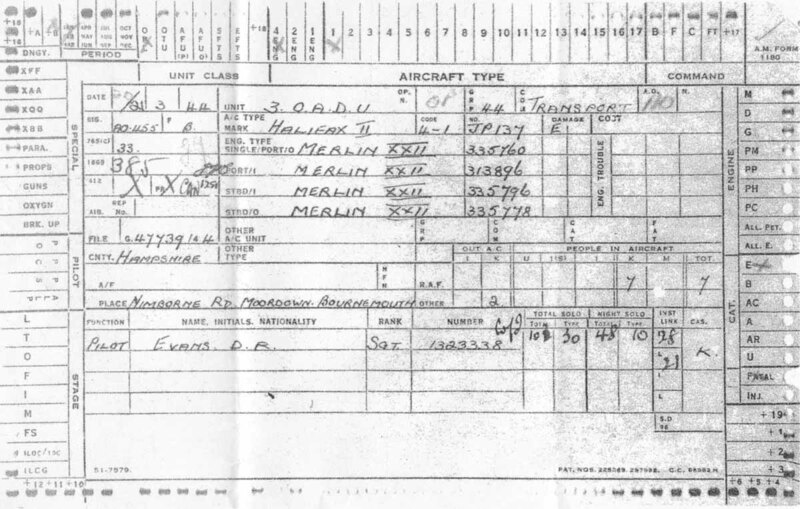 A.M. Form 78 is the record card of each individual aircraft. This form shows the brief history of JP137. It shows that Halifax Mk II serial no. JP137 was manufactured by the London Aircraft Production Company (part of London Transport!) as part of a batch of 250 aircraft, and that it had Rolls Royce Merlin 22 engines fitted. It was delivered to the RAF from the manufacturers Leavesdon site in late November 1943. It then passed through various Maintenance Units ('MU') to be modified and 'kitted out' with equipment specific to it's forthcoming role, which was believed to be carrying out Special Operations Executive (SOE) 'drops' over Yugoslavia. At the end of February onto No.1 Overseas Aircraft Preparation Unit (OAPU) at RAF Kemble, near Cirencester, and then to 301 Ferry Training Unit at RAF Lyneham in early March. Finally, to No.3 Overseas Aircraft Dispatch Unit (OADU) at RAF Hurn on the 16th of March, 1944. The next entry 'Dest. MAAF' shows that JP137 was intended to join the Mediterranean Allied Air Force, in North Africa. Sadly, as we now know, it never arrived. The entry 'Cat E (burnt)' is the official way of describing a completely burnt out wreck. The final entry. 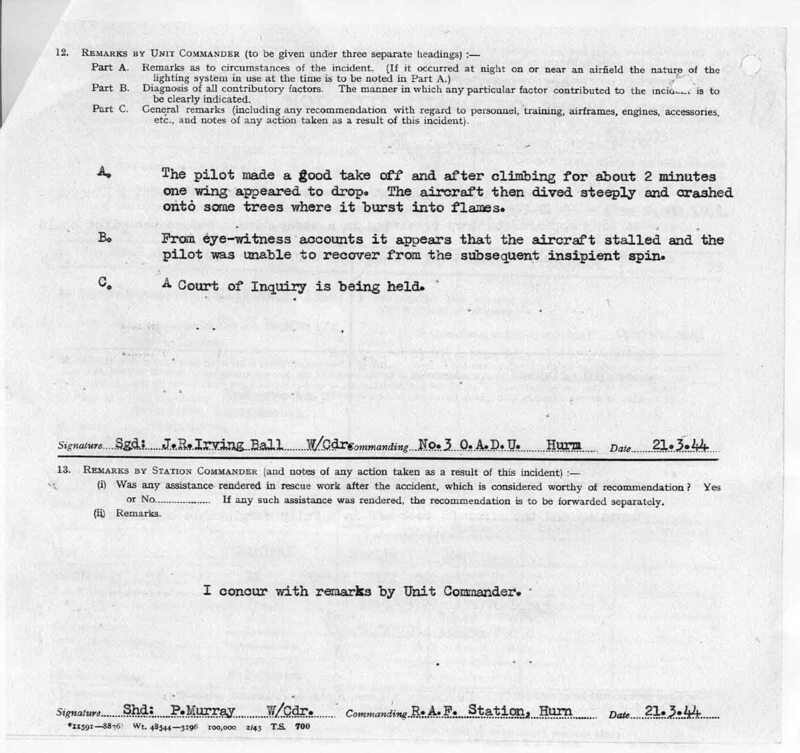 'SOC' (Struck Off Charge) describes the final removal from operational records. 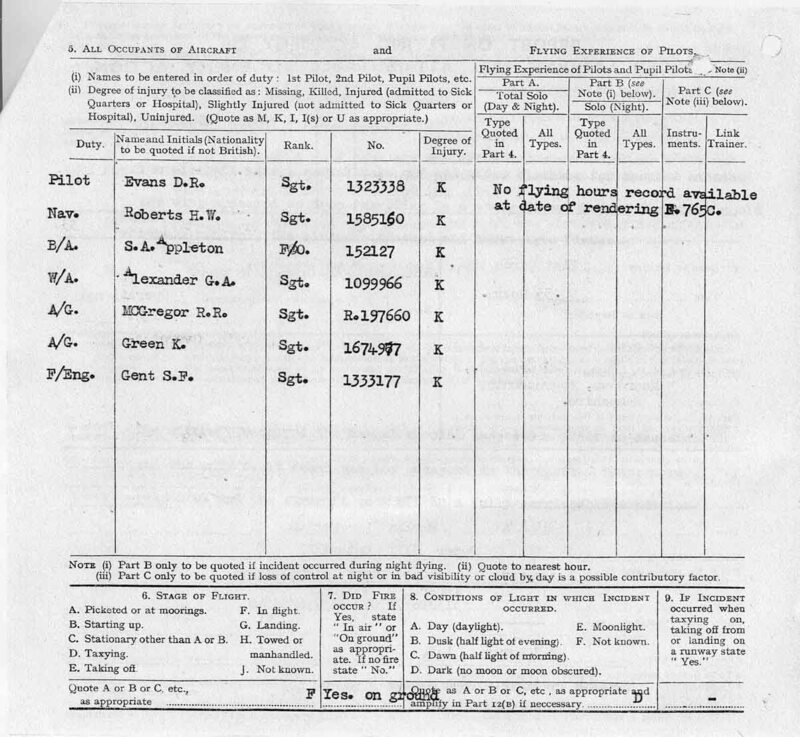 The A.M. Form 1180 is the document that served as a common 'collection point' for other records and documents, that would be generated as a result of an RAF aircrash. It is often the only record that survives, for many incidents from WW2. We were fortunate ehough to obtain a copy of the AM1180 for JP137, and both sides of the form are shown here. (Left click to see the images in greater detail - remember to use your back button to get back to this page - or right click to open the image in a new tab). It also includes details of the incident location, and the name of the pilot. Dotted around the edge of the document are a collection of boxes, some of which have crosses, ticks, and numbers referring back to other documents. It is rather poignant to notice that it also includes the number of hours the pilot had flown - both in total, and for the aircraft type. As you can read, Sgt. Evans only had 10 hours 'night solo' on a Halifax. As we have discovered, the kind of problem he most likely encountered immediately after take off, would have been impossible to correct, even for an experienced test pilot. So a 20 year old, with only a few hours, stood no chance, even though we believe that he was regarded as an exceptional pilot. The reverse of the AM1180 gives witness detail of the crash, together with a brief description of the results of the Court of Inquiry held 2 days later. This was of course quite impossible to verify - there were no survivors! This is damning evidence. It is now known that the Halifax MKII aircraft had a serious tail design fault, which made the aircraft virtually impossible to fly under certain conditions. The suggestion of a possible rudder failure, in such a short précis, indicates that this was a well known problem. Indeed, significant amounts of data, secret at that time, had already been collected on the problem. As a result, the subsequent MKIII Halifax aircraft was fitted with a seriously modified tail rudder! Notice that the lowest box 'Blame and discip action' is empty. As it should be. There were no survivors, and any undefendable suggestions of pilot error would have been totally inappropriate. This fact became an important part of the project, as you will read in other notes. The report form 765(c) shown below is not commonly located in these cases. 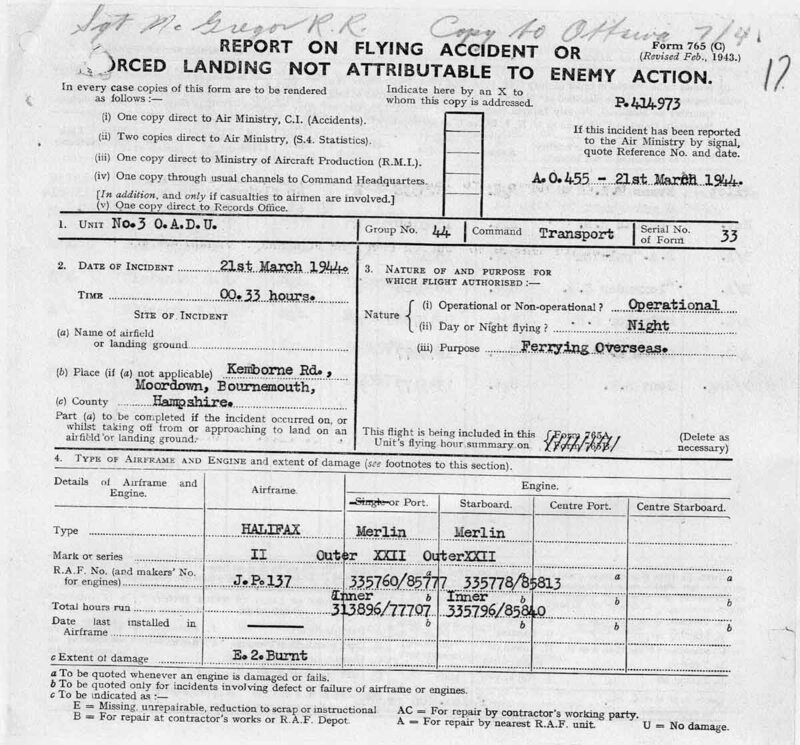 It was a preliminary report on flying accidents not attributable to enemy action, and was usually prepared almost immediately after an incident. As such, it often contained information that needed to be corrected later on, once further investigations - including a Court of Inquiry where appropriate - had been carried out. The possibiblity of the 765(C) form being inaccurate is one of the main reasons given by the RAF for their general reluctance to release the form publicy. Other organisations take a different attitude on these matters, and as one of the crew of JP137, Sgt. McGregor, was a Canadian, it was from the Canadian Authorities that our copy of the 765(c) form was acquired. In fact, there is little extra information to be obtained from the form, in this case, but as the RAF suggested, it does contain some errors! The first page suggests the incident took place at 'Kemborne Rd', for example. One fact that was gratifying to read was the crew list. Although much careful research had been carried out to ensure we actually had the right names, this was the first official form we had seen, from the period, that listed all 7 names in one place. Page 2 also states that there was a fire 'on the ground'. It makes no mention of a fire in the air, which seems most likely to have occured, based on witness reports. Page 3 includes the interesting comment 'one wing was seen to drop'. This was of course, a significant comment, bearing in mind the subsequent events. 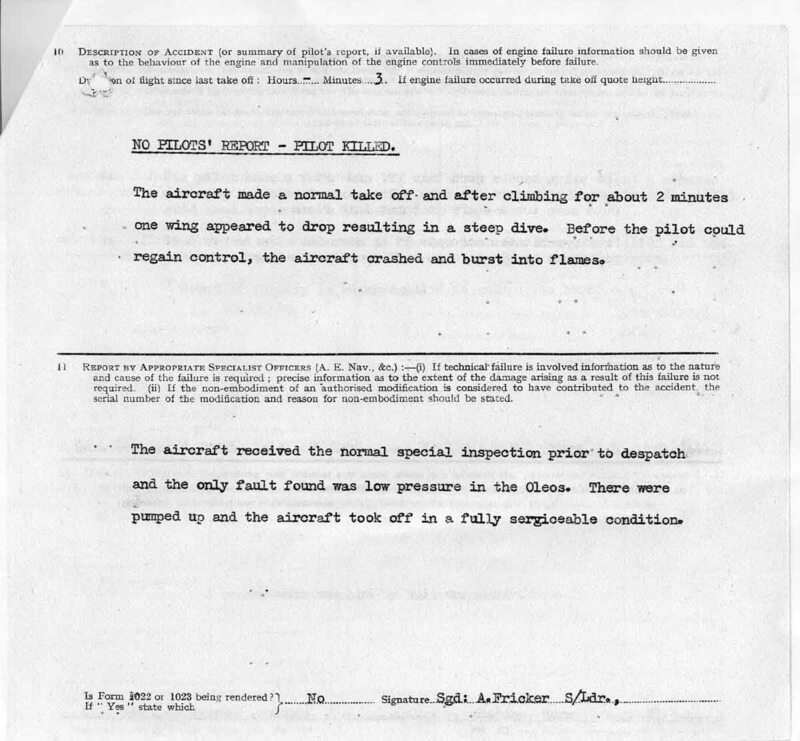 It is interesing to note that at this early stage (this report is dated 21.3.44 - the same day as the crash) it is reported that the aircraft 'crashed onto some trees'. Not, as we now know, entirely accurate! Why, you may well ask, did the RAF decide to prepare a report so early? The answer, I suspect, was just to get the 'paper trail' started correctly. There were all sorts of implications - for pensions, for civilian compensation claims, for probably a dozen other reasons - that required the documentation to 'be correct' (as far as possible) even at an early stage.